As of this writing, there are 291 customer comments and 42 answered questions for the Keter Round Outdoor Storage Table Deck Box. I have read the customer feedback and then condensed the results into this review. I hope that this review helps you when you're shopping for the best outdoor table to add to your porch. Ventilated sides keep items inside the storage tub safe and dry. The Keter Round Outdoor Storage Table Deck Box has a storage section underneath the top lid of it. It is perfect for storing garden supplies, decorative outdoor pillows, pool floats, toys, pet supplies, and more. Its ventilated sides ensure that everything you store stays safe and dry no matter the weather. This outdoor table is a multi-functional piece. It could be used as a coffee table, or you could use it for parties. Its compact size and circular design make this outdoor table ideal for use in any small outdoor space. The Keter Round Outdoor Storage Table Deck Box can hold 37 gallons inside of it. It can also support up to 308 pounds. It will not warp, dent, rust, or peel. This outdoor table is weather-resistant, waterproof, and UV protected for outdoor use. There are built-in handles so that you can easily carry this outdoor table. It is easy to assemble. The external dimensions are 26.7 inches diameter x 16.5 H inches. The internal dimensions are 23.5 inches diameter x 15.7 H inches. When it rains or snows, the moisture will not drain off so be careful when you open it so that water doesn't get in the storage area. A customer explained, "The top, while it does keep water out during rain, doesn't leave anywhere for all of the water to drain off. So if you open it while there is still water in the cracks on top - that water will probably go into the storage area. All in all, I find that acceptable, as I'm only storing the kids' outdoor nerf/super soaker and sports toys in this thing." The customer reports coming in about assembly were mostly positive. Be careful though that you don't pinch your fingers when putting pieces together. A customer explained, "The directions were easy to follow. But notice that you are recommended to wear gloves, so you don't pinch yourself snapping the pieces together. And it does take a little patience because they really do have to be pushed into place with a little strength so that they completely snap into place. I posted some photos for an idea of how much it holds and the scale compared to a dining chair." Customers found many storage uses for this outdoor table. One customer gave some examples that might help you think of what you could use it for. She said, "We needed something to store some pillows in behind our home for our fire pit area. This was a perfect solution and holds a total of 6 average stuffed accent pillows which measure approx. 12”tall x 12” wide by 6” thick. It has a wood-like texture, neutral color and looks great. Some ideas you could use this for include being an end table, toy box, outdoor storage bin, front - rear porch table, etc. If you have a large trash bag, you should even be able to line this and use it to hold some ice – drinks. (Not insulated, so keep that in mind if using for drinks. )...Very happy with this item and unless I am missing something, this will be lasting me quite a long time." There were quite a few comments about some of these storage tables not arriving as the description stated. Since some arrived fine and others didn't, it seems to be a quality control issue. Here is one of those comments, "Unfortunately, mine came with a top that's missing its decorative side, so it's just ugly molded plastic on the lid, instead of the fake wood/grooves you see in the picture. I just emailed customer service with photos of the defective piece, so now I'll just have to wait and see if I can get this corrected. It's a pain to have to do this though! Definitely, do not assemble until you know all the pieces are there, and also complete, because once it's together, you CANNOT get it back apart. Otherwise, I'd just send this back to Amazon and not have to deal with parts replacement." And another similar customer comment: "There is a serious quality control issue here! The second unit took me over 2 hours to assemble! The cutouts, projections, and notches where the panels 'click' together were NOT precision cut like the first unit. The parts refused to snap together. Eight out of the eight panels required painstaking trimming with an Exacto-style razor sharp blade. I took photos of the poor finish, and the numerous openings I had to trim/refine by hand cutting them. Bah humbug! There were given as Christmas gifts, and I didn't have time to return the second, 'defective' one. Amazon needs to know that some of these units are of 'seconds' quality! I was going to order another, but now hesitant for fear that I'll receive another unit that should not have passed quality control. Both lids have minor scuffs out of the box, but that is nothing compared to the utter torture and waste of time it took to re-tooling and assembling the defective one." With external dimensions of 26.7 inches diameter x 16.5 H inches and internal dimensions of 23.5 inches diameter x 15.7 H inches this is not a huge storage table. The smaller size was a selling point for some customers. One customer commented, "This storage table is very nice, I'm impressed! I was downsizing from a huge deck box/bench that was in really bad condition. I wanted something smaller, easy to move around, that could double as a seat or table, and sealed well. I love it. The directions were easy to follow. But notice that you are recommended to wear gloves, so you don't pinch yourself snapping the pieces together. And it does take a little patience because they really do have to be pushed into place with a little strength so that they completely snap into place. I posted some photos for an idea of how much it holds and the scale compared to a dining chair." I read through the price comments and also considered the price with what you are getting. This is by no means a bargain but it's not super expensive. It's a fair price, but not a great price. Here is one of the price comments, "So easy to put together- No Tools Needed! Attractive and holds quite a bit without taking up a lot of space. Reasonably priced." Water may seep in when you open the lid if water is on top of table. The Keter Round Outdoor Storage Table Deck Box is an outdoor table that has a storage section underneath the top lid of it. This outdoor table has ventilated sides so that the contents stay safe and dry no matter the weather. The compact size and circular design make this outdoor table ideal for use in any small outdoor space. This table can hold 37 gallons inside of it and also support up to 308 pounds. It will not warp, dent, rust, or peel. It is weather-resistant, waterproof, and UV protected for outdoor use. There are built-in handles so that you can easily carry this outdoor table. It is easy to assemble. On the downside, there were comments about quality control issues and also of the lid not fitting properly. Other than that, the price is good and this is a nice little outdoor storage table. The external dimensions are 26.7 inches diameter x 16.5 H inches. The internal dimensions are 23.5 inches diameter x 15.7 H inches. Here are some top questions that I found for people considering buying the Keter Round Outdoor Storage Table Deck Box. What material is this outdoor table made from? 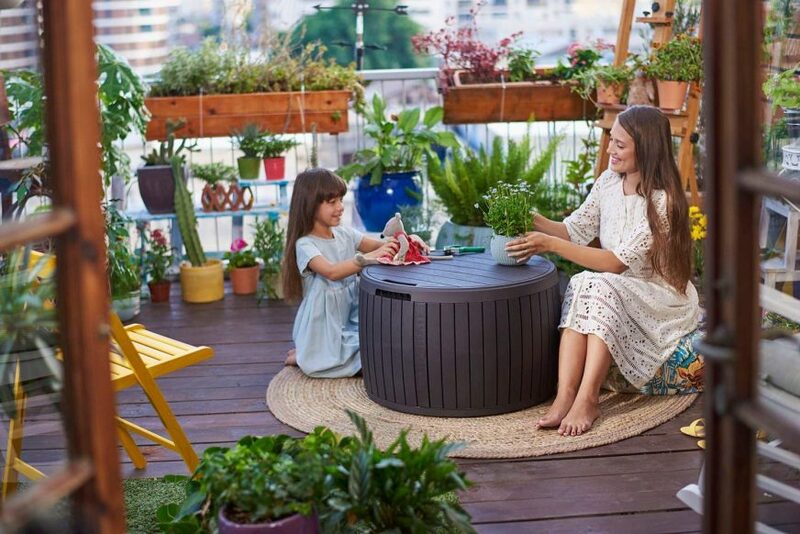 The Keter Round Outdoor Storage Table Deck Box is made from plastic. Would this outdoor table work as a coffee table for a half moon shaped sectional patio sofa? Yes, it should work great for a half moon shaped sectional patio sofa. Could I use this outdoor table as a cooler? You could, but there wouldn't be any drainage for the ice.